Rolando Gapud is a Filipino businessman and current Executive Chairman of the Board of Del Monte Pacific Limited (DMPL). DMPL owns and operates a group of companies that caters to today’s consumer needs for premium quality, healthy food and beverage products. In February 2014, DMPL acquired the consumer food business of Del Monte Corporation in the United States, which has been renamed Del Monte Foods, Inc. In 1961, Rolando Gapud graduated with honors from Ateneo University in Manila, Philippines, where he received his B.A. in Mathematics. In 1964, he received a Master of Science degree in Industrial Management from the Massachusetts Institute of Technology. During his studies, he researched management theory in depth and went on to publish a book titled “A Measure of Information System Efficiency”. 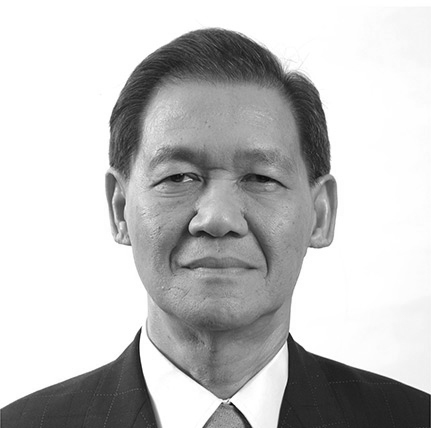 Since the early 1970’s, Rolando Gapud has served as CEO and sat on the board of various companies active in areas ranging from pharmaceuticals to banking, operating from diverse geographical locations such as Manila, Hong Kong, New Delhi or San Fransisco. For the detailed list of positions held, click here. Rolando Gapud is also involved in a number of community development projects, either on his own personal time, or through Del Monte’s corporate social responsibility initiatives. His contributions include the promotion of higher education through donations to the Sloan School of MIT, where he is a member of the Asian Executive Board, as well as community development initiatives in the Philippines, where DMPL operates the largest integrated pineapple plantation in the world. You will find more details about these activities on the Community Engagement page.